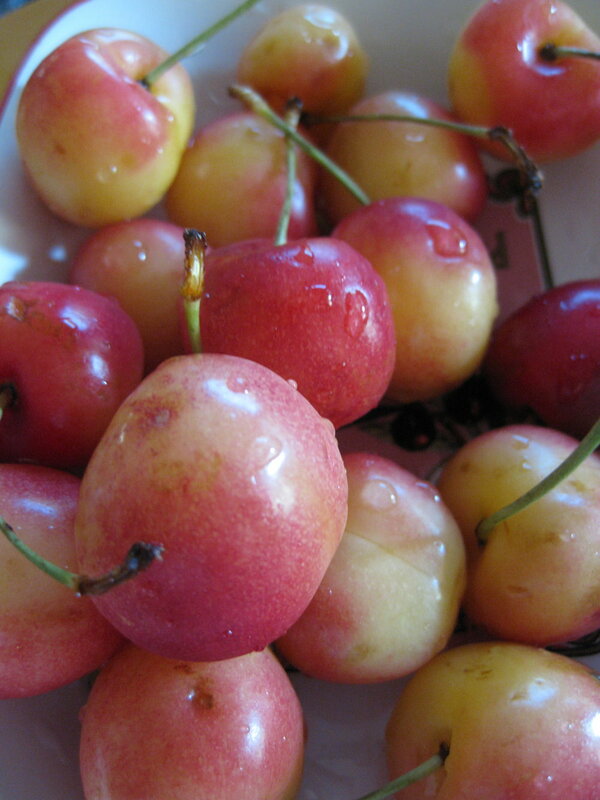 These are Rainier Cherries and they're very ripe. L kept begging for some, but he only liked squeezing out the pits. Thanks to all who wrote words of sympathy here, on Twitter, and on Facebook. Jake was old . . . roughly fourteen years old. A little about him so that you know what kind of a fellow he was . . . Meredith adopted him when he was six after having passed through a few owners who couldn't handle him. His first owner passed away while Jake was in his care and he was trapped in the house with his dead owner for three days. I think he was traumatized a bit from the experience. When Meredith adopted him, he was grossly overweight, weighing about 95 pounds. Male German Shorthair Pointers should weigh between 55 and 70 pounds. So we ran him. We ran him a lot. When we lived in Upstate NY, there were several parks where we'd take him off lead. He loved to swim, too, so we took every opportunity to take him to a lake or a reservoir. After we bought our house in Washington, he had about 7 acres . . . all his. So, he had a good life. He'd wander into an occasional skunk, dig up the occasional bone, and go through the occasional garbage can, but on the whole his bark was worse than his bite (he never bit anyone). Before we had our first son, we were worried that the dog would have problems with his new status. Of course, our concerns were unfounded. We've told our son that his dog has passed away, even though our son is only a toddler and probably doesn't understand such things. I sure don't. There are times at night when it's so quiet in the spaces where he once slept. And the quietest places are often, strangely, the loudest sounds. I did have a dream about him the other night. His fur was wet, as if he had been swimming, and he was running like he always did, a few yards ahead. In life, he always made sure to come back, but in the dream he kept running.